Many Thai church planters are working in small villages where the new church is not able to fully support them and their families. Mushroom cultivation has proven to be an effective means of providing partial support for pastors and church planters as it does not require full-time commitment to working on the project. A pastor working on a mushroom cultivation project finds he or she has plenty of time left over for evangelism and pastoral care of new believers. Thailand has ideal environmental conditions and a long history of successful mushroom growing. The warm climate is ideal, and the equipment required is readily available. The most popular type of mushroom is the straw mushroom which is highly nutritious and sells in the market for 90-120 bahts/kg. The mushroom shed is built of concrete blocks with two rows of shelves inside. These houses are highly tolerant of severe heat treatment during in situ pasteurization. Being secondary decomposers, straw mushrooms need compost and need to be pasteurized to protect them from disease. Six sheds are needed for a fully fledged project because of the life cycle of the mushrooms which means they will be in different stages, for example while some are growing, you need another house to plant a new crop of mushrooms etc. 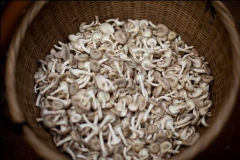 The straw mushroom is a high temperature mushroom and the mushroom that is most popularly grown in Thailand. Thai farmers have grown straw mushrooms since the 1940's and have found that the Thai temperature range of 30-37 degrees is very favourable to the mushrooms' growth. The spoors are easily available and the mushroom is able to be cultivated on shelves. There is a huge market for these mushrooms. Indoor cultivation of straw mushrooms can be performed throughout the whole year. Straw mushrooms grow well in organic compost where the ingredients are partially decomposed or highly degraded. The compost is placed on the shelf and steam is blown into the house with the temperature maintained at 60 degrees for 4-6 hours. After cooling, the mushroom grows with a cultivation yield of 50-60%. This is a pilot project and once we can assess how this is going we will look at duplicating it in other areas. Bright Hope World has partnered with World Outreach in Thailand since 2001 (Good News Team, Top Kids, Heart of Mercy) and in 2010 started financially supporting three church planters (THA01e) associated with the Thailand Evangelism and Mission Centre. In dialoguing with Lorraine Deirck regarding this, the discussion was held as to whether there was some sort of income generation project we could introduce to enable church planters to support themselves. 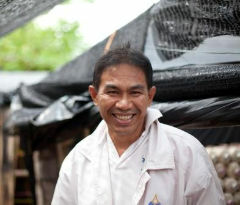 In May 2010 one of their church planters approached Lorraine with the idea of starting a mushroom cultivation project. Appropriate research and figures were done and we believe this is a viable project to enable Thai church planters to financially support themselves. Initially one church planter will start the mushroom cultivation project but as the mushroom farm begins to be profitable, he will then share the profits with other church planters so they can support themselves. We anticipate this pilot project will enable six church planters to support themselves. Some church planters have successfully used mushroom farming already as a way of supporting their families and they are willing to serve as resource people for Thai leaders who are looking for a way to generate more income. We believe this is a viable project where we can help Thai workers with start-up finance so they can serve the Lord and take care of their families at the same time. 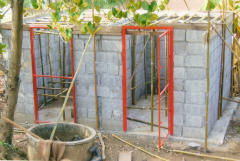 The mushroom farm will work as a co-operative venture so will not only provide for the church planters needs but also bless the village where he is working. Pastor Tossapon is the church planter who will start this pilot project. He is married with two children and very pastoral. The churches he is working with are very small and the communities are mired in poverty. He has enough room on his own family land to use for this project. For many years Lorraine Dierck, a World Outreach missionary from New Zealand, has been involved co-leading the Good News Team (THA01a). However in 2008 her role changed significantly and she started a new work with church planting teams at the Thailand Evangelism and Mission Centre. The major activity is training and strategy development in partnership with the Good News Team and Muangtong church. To assist church planters to build a sustainable income that helps the whole community rather than depend on ongoing support from outside. After the initial investment, the project should be sustainable without the need for any additional finance although there is the potential to start up more projects in other areas.